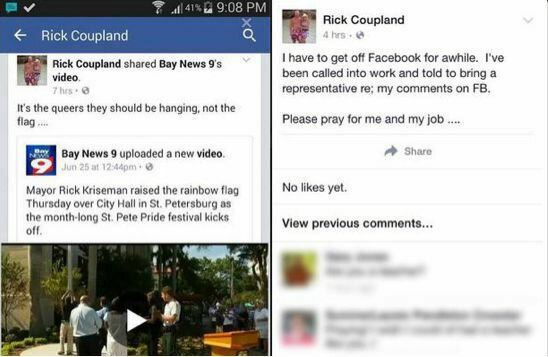 'It's the queers they should be hanging, not the flag,' said professor Rick Coupland in a comment about the raising of rainbow flags. “We have several policies that apply to the conduct of our employees,” college spokeswoman Kelly Wiley told the Kingston Whig-Standard when the investigation began. “This includes the fact that we adhere to the Ontario Human Rights Code; we also have harassment policies, a policy around outside activities of college employees, and our collective agreement.” The human rights code bans discrimination based on sexual orientation. Coupland declined an interview with the Kingston paper, but when the investigation started, he wrote on Facebook, “Please pray for me and my job.” His entire Facebook page has now been deleted.